The quick answer is that the better the return (interest rate) then the more buyers there will be. In today’s market many will be non-US, so if they want the return then they have to sell their respective currency and buy USD. The ‘quick’ part of the question is very relevant - trading robots that are ascribed as being AI will react on any hint of news or numbers that could possibly be construed as leading to an interest rate change - a comment from the Fed, a tweet from the Pres, an unexpected market number etc. One other little thing about FA - it doesn’t matter if the concept is correct insofar as economics are concerned, what matters is how price reacts - and generally it reacts so simply. 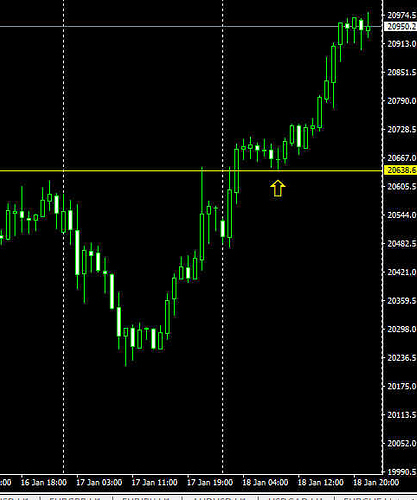 Right now the S&P is on the rise for the week close - so risk is on - all is well - check S&P today. So what about Gold - sell it, why buy gold when feeling risky? 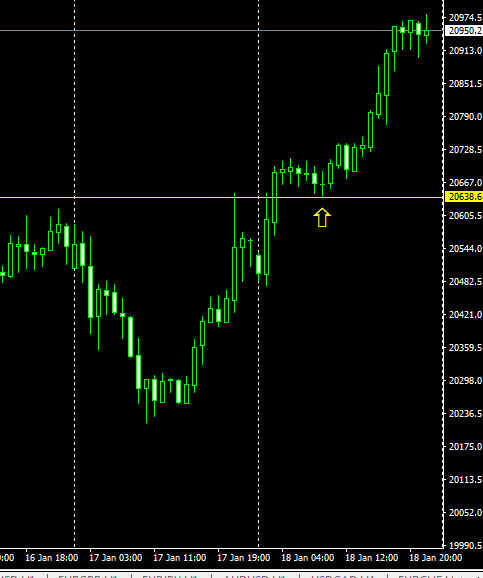 - check Gold today. Hmmm… yen - the olden guys say that Japanese investors are cash rich, a nation of savers (savvy) and in times of risk on they sell their yen to buy the risk - check Usd/Jpy today. And back to the ‘quick’ part - why the risk on today? 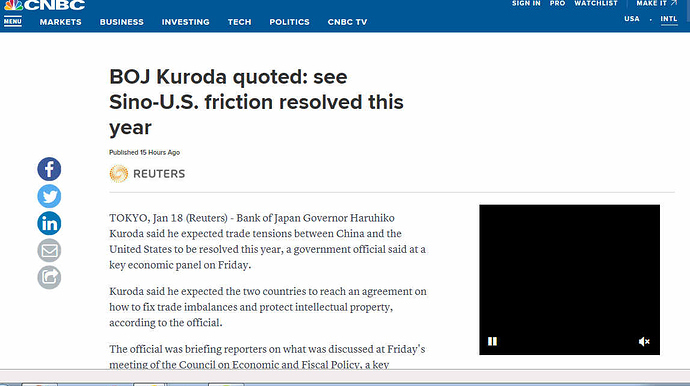 TOKYO, Jan 18 (Reuters) - Bank of Japan Governor Haruhiko Kuroda said he expected trade tensions between China and the United States to be resolved this year, a government official said at a key economic panel on Friday. News! changes sentiment, it started yesterday with Presidential tweets and continued today with an FOMC speech. mid, you are right, but mostly guys like to follow TA. The Artificial Intelligence picked up on this at what time? Is this an acronym or an actual news service? Apologies, mostly I’m not so good with words, I tend to imagine that everyone can see into my thinking. The programmers on the Algos are afraid to take risks so they play it safe - do what the old guys always did. Thank you all so much for your replies, t really helped. Just want to confirm and make sure my thinking is right. Hawkish monetary policy is when interest rates are increased and that’s known as restrictive monetary policy. And then a question, if interest rates = more borrowing and economic growth, does that slow inflation and if so why? So then dovish = lower interest rates = more inflation? I thought inflation accompanied economic growth, such as higher interest rates, is that wrong? CuriousPips, we the human race produces more people and of course you can break that down by country we need more money brought into circulation and here’s the rub it has to be backed by something. In our modern society that something is called debt and the good faith of the country government creating that debt or you might say the good people of that country/currency. This is all a spiraling effect which we call inflation. So releasing to much new money (backed by debt) to fast cause growth inflation to little and we have stagflation. Anyway that’s the way I see it, mind you I am not any type of economist. When I first started trading forex all of two years ago I wanted to write some type of program that monitored the key commodities around the world and build the tecnicales nation by nation to predict the currency rate interaction and their are a few that have done this. However I am not getting any younger and decided that this project wasn’t necessary that forex was controlled by the central banks no matter and trade/forex is controlled with in a very narrow range. Further the only reason forex trading works is because of the leverage offered to traders as the actual price moves very little daily. Think like a small business - imagine that you are selling lots, buyers everywhere, so what is your temptation? Simple, charge more and make more profit. This is what happens in economic growth, lots of buyers (spenders) so prices rise (inflation). CB’s then try to curtail this buying/spending by raising interest rates - thus if the buying/spending is on a credit card then it will cost more - hence curtailing the spending. The only other way to curtail the spending is to reduce wages… that’s beyond the remit of any central bank - this is the reason why wages growth is a leading indicator. But as always the market resides in the now. There you go, 3 days later and the latest earnings numbers are released - as mentioned - an important leading indicator, see the immediate GBP effect today. This post for guys learning FA in later weeks/months - check the link 2 posts back - (one week back from now). See the little chart, see too the trend on earnings, then check the thread title. Often you will read that FA is useless, it’s always priced in or that it is extremely complicated. Check out my little post on why central banks change interest rates, then also why it is that the market will front load numbers like earnings. Edit: remember that the market is like a child, it has a short attention span and lives in the now - next week likely to be different. Peterma, I think today’s big dollar black eye was due to the Euro great equity’s reports with even over shadow the S&P pushing the USD south and other north. Aye Mid, not so much the stocks, Gold is the driver - “Chinese gold demand for the Lunar New Year” - whether real or not it’s not a time to sell gold - check the daily - rising way earlier than stocks. Then have a look at Eur/Gbp - that cross as usual is a good indicator of pound and euro strength on the day. peterma, thank you for the insight! I do follow forex metals but only XAUUSD and XAGUSD. The Chinese insert makes mucho cense. Mid, the guy to read is one John Murphy for insight on precious metals and FX - a simple approach is to view Gold as the alternative currency to USD - especially on short term. There is a little more to it, but have a look today - see the big push up on Gold, then check USD/JPY and the timing of the move down. 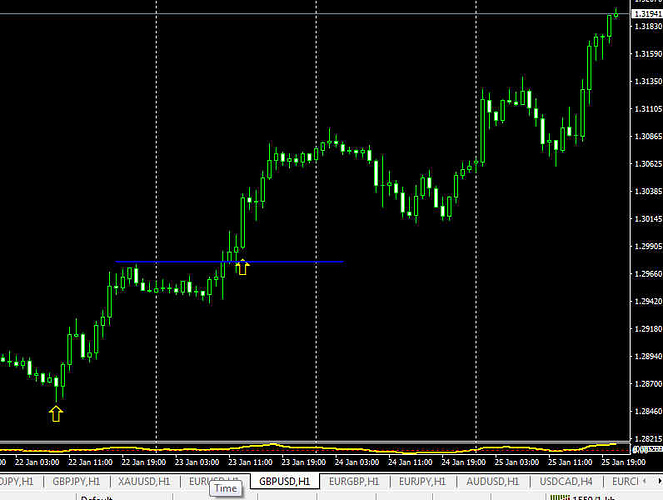 Then home into Eur/Usd at the same time - not a time to buy the dollar. Interest rates rising gives lenders incentive to buy USD relative to other currencies because the USD tends to perform flatly. On the other hand it reduces incentive to borrow USD so rates rising doesn’t necessarily mean the USD will appreciate because this creates long-term consequences. The USD thrives on tying up money.